個人學經歷中英文簡介 - 趙博士簡介(Dr. Chao Resume) - 趙永祥博士(Dr.Chao Yuang Shiang) 學術論壇(Global Forum) - Powered by Discuz! Favorite Business Publication: Three finance-related books published from 2012 to 2014. Charity: Adviser for Middle Class, How to Creare Business models and Write Proposals to get the funding from the financial institutions. What Does He/She Attribute Success To: He attributes his success to his ability to finish projects before a deadline and give proper advice to the owner in creating business or how to write a successful proposal to get the funding from the financial institutions, in addition to his extensive experience in governmental institutions. Why did you become involved in your profession or industry? : He became involved in his profession because he previously worked in a big enterprise, advising customers on how to invest their money into financial products, which was similar to a consulting position. It was a natural progression from that point. Extended Bio Profile: Dr. Chao is most proud of being a contributor in international finance research field, and wants to provide more effective research outcomes connected with governmental policies and academic institutions. Most of his current students work in financial institutions, insurance companies and stock markets. Dr. Chao has acted as a financial and strategic consultant in several medium-sized enterprises since March 2005. He expects that there are two main academic directions to do subsequent research in the future. Dr. Chao hopes to revisit and reevaluate the applicability of existing research to connect theories in light of the changing conditions of global business. In addition to his assistant professor position in Nanhua University, and previously, Dr. Chao has taught for more than 16 years in university and advise many students to provide their financial knowledge to contribute themselves to organizations/society. 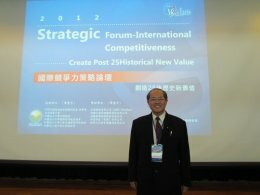 Where Will You Be In 5 Years: In the coming years, Dr. Chao hopes to promote himself to the international academic community, and publish articles/finance-related books. 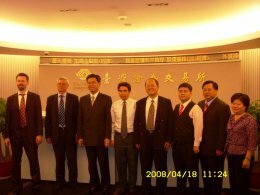 In Taiwan, the governmental institution has a project and they needed a scholar or expert to join; Dr. Chao was asked to join governmental projects at the request with his colleagues. He would also like to progress to professor level with the university as well within the next six years.